Reiki Share = Awesome, Healing Energy — Multiplied! Come celebrate your gift of Reiki with us, and practice with others who love it! Our Reiki Share is a way to both give and receive Reiki in a low-key community of acceptance and mutual respect. Reiki Share is a way to both give and receive Reiki in a low-key atmosphere of acceptance and mutual respect. 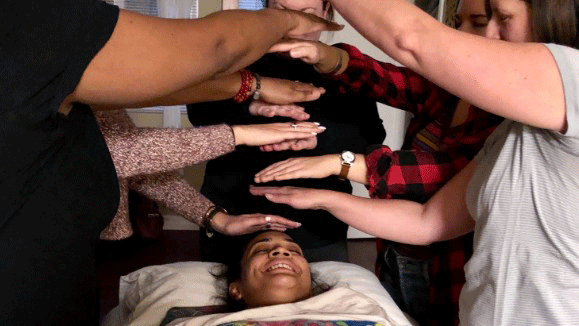 If you are a certified Reiki practitioner, at the level 1, 2, Advanced or Master level, who would like to practice with other practitioners of Reiki in Daylight’s healing environment and if you would like to meet Reiki practitioners from all walks of life, this is the place for you! Reiki is Source-guided life force energy. It is a gentle, healing energy that is administered through the laying on of hands on or around the body. It feels centering and light, yet deeply calming and nourishing for the whole being. The Reiki share leader is Maureen Rivelle, retired RN and active Reiki Master Teacher. Maureen’s teaching and private practice is called Open Hands Reiki and is located in Edmonds, at Daylight Healing Center. Maureen has practiced Reiki since 2006 and has seen so many blessings! She also has Reiki classes coming up this month and next, so check her website for details on classes and certification! We will start with introductions and a short meditation. Then we will proceed to take turns giving and receiving Reiki from the group of practitioners. Daylight Healing Center will provide some tasty snacks, hot tea and water for you to enjoy. Let’s practice Reiki and experience the lovely, healing energy together! BE SURE TO ARRIVE BETWEEN 6:30 AND 7:00pm. THE DOOR WILL BE LOCKED AT 7pm to avoid interruption.